This piece on dating for introverts appeared in the Huffington Post this week. As the title suggests, almost all of us hate small talk and the article contains some good tips for getting over the hate factor and making progress on the dating front. I appreciated being asked for my thoughts on the topic and spoke with a few millennials who are in the dating world. Here are some additional tips and other angles they shared that didn’t make it into the article. I think tip # 2 is pretty creative. Do you have any to add? 1) Go to the party.Being there the whole time will be exhausting…You don’t have to stay. You may find interesting people to follow-up with on social media or in person and then you can make a quiet exit. 2) Introverts tend to use social media with thought and purpose. Peruse Instagram to find interesting posts. Comment and like photos. You can morph these connections into offline dialogues with those whose postings you like. These online interactions can lead to dates. 3) Be open to occasional random conversations. Extroverts love to start these and they do the bulk of the work holding the convo with their questions. Instead of putting on your earphones the minute you get settled into your airplane seat or at your local coffee shop, try responding. You will likely take the conversation to a deeper level. Opportunities to get off our phones and truly engage are around us if we take the time to look. I know of several quieter friends who have met their future spouses this way. 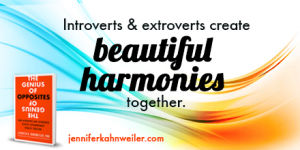 4) Introverts are known to shy away from conflict. All the “talking it out” is a turn off to them. Dating past the honeymoon phase inevitably will be tricky but you may want to avoid your instinct to run away from the first fight. Research shows that the most successful partnerships emerge when couples work through these sticky situations. 5) Follow your interests to lead to other like-minded people. Join a hiking club for weekend hikes or that art class you have always thought about taking. Introverts prefer to go deep rather than engage in superficial small talk. You will get to know others in a more natural, low-key way. The relationships you build might not immediately lead to “Mr. or Ms. Right” but you will definitely expand your network. This entry was posted in Uncategorized on December 24, 2016 by Jennifer Kahnweiler.